Daily high soil temperatures at the 2-inch depth are consistently getting into the 60s°F. Yesterday, temperatures in sunny locations reached into the upper 60s. This means that the warm-season species are, or will be soon waking from winter slumber. Leaf tips emerging from rhizomes of kyllinga on 15 April 2015 in central New Jersey. 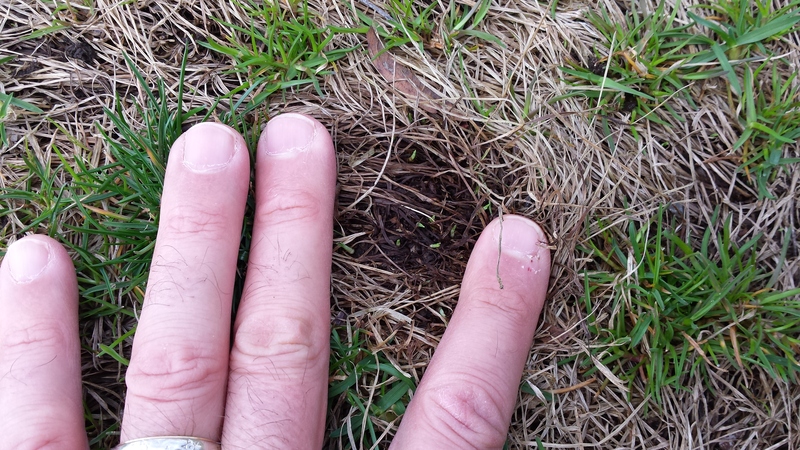 Emerging shoots of kyllinga beginning the process of re-forming a “turf” canopy on 2 May 2015 in East Brunswick. For the last three weeks, I have been watching the emergence of false green kyllinga (Kyllinga gracillima). Most sites infested with kyllinga are probably showing active shoot growth. So it appears that kyllinga needs soil temperatures that reach consistently into the 60s to emerge from winter dormancy. As temperatures continue to warm, re-growth of kyllinga should accelerate. False green kyllinga is a perennial sedge species with well-developed rhizomes (underground lateral spreading stems). 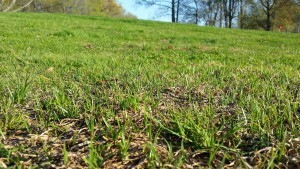 Kyllinga is relatively low growing so it thrives under mowing. It grows prolifically in poorly drained areas or areas that are frequently wet. Thus, invasion of kyllinga is likely to be more severe on over-irrigated properties. In these cases, irrigation should be reduced but realize that this change in practice alone will only slow the invasion. You should not expect eradication of kyllinga simply by reducing irrigation. Because of the lateral spreading growth from rhizomes, kyllinga can form large mats which are very difficult to control once formed. 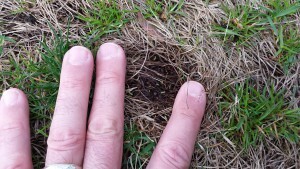 The phasing out of arsonate herbicides, which were effective at controlling kyllinga, is one reason for the emergence of kyllinga as a troublesome invasive weed in turf. Unfortunately, there are limited herbicide options for controlling kyllinga in New Jersey and similar climatic regions. 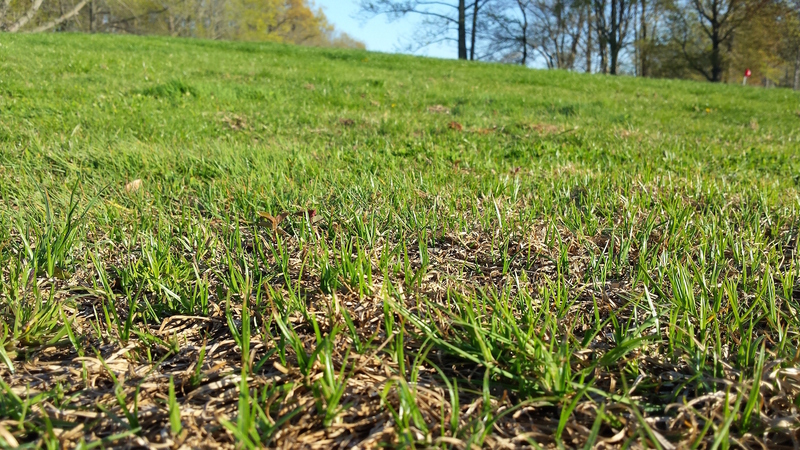 Preemergence (crabgrass) herbicides will not control established mats of kyllinga. And there currently isn’t a commercially available postemergence herbicide that will provide excellent control of false green kyllinga in cool-season turfgrass. SedgeHammer (halosulfuron) and Dismiss (sulfentrazone) are the two most commonly recommended herbicides for kyllinga. But neither herbicide will be able to control large mats of kyllinga in a single application. Very large mats of kyllinga will require a minimum of two applications to suppress this weed. SedgeHammer is reported to be more effective at suppressing false green kyllinga. To date, our trials also indicate that SedgeHammer is the more effective herbicide but more trials are needed to confirm this. We are also looking at other herbicides options but so far we have not found a highly effective product. Thus, it is important to understand that a well-coordinated, long term program is needed to suppress kyllinga. Catching the problem early before the kyllinga mats become large, applying an active herbicide correctly, and being persistent are keys to suppressing the weed and eventually achieving control. It is critical to follow herbicide label instructions for the suppression of kyllinga. For example, a non-ionic surfactant at 0.25% v/v must be added to the spray solution of SedgeHammer. Follow label instructions for herbicide rate, spray volume, timing, and length of time between repeat applications.